Being frugal has been away of life for me ever since I was a child. My father grew a huge garden and we raised our own, chickens, turkeys, pigs, steer, and veal calves. When I became a mother and had children of my own. I learned quickly how to use coupons to save money. Believe me saving now does help out later. We have tested this more then I would like to say. We are able to do things others who live on the same budget as us can not do because of the savings we take advantage of. Since we don't have a place to raise our own meat, and only a small yard to grow vegetables, I have learned what prices I am willing to pay for meat, and when they hit that price we stock up. Having the right kitchen tools is needed when you buy large pieces of meat, or packages that need to be cut down into smaller meals. We do have a mallet meat tenderizer but for things like skirt steak you really need a meat tenderizer like this one by Kuuk. Makes the difference between eating leather and having something that is tender and delicious. This is a very sharp item so please keep away from children and even as an adult be very careful while using. I love how easy is it to use. You can purchase this meat tenderizer on Amazon. Meat has always been expensive, and with prices soaring higher than ever, all you can do is buy the least expensive cuts and hope for the best. With our Professional Meat Tenderizer, you don't need to worry. Thanks to its 48 razor-sharp blades, our meat tenderizer cuts through the connective tissue that makes meat tough, to improve both its appearance and flavor! In short, it can transform a cheap cut into a juicy, pricey-looking one! Ever wondered why steak is so juicy and tender in expensive restaurants? This is their best kept secret: tenderizing meat cuts retains juices, which makes for less shrinkage and fuller flavor! Did you know that by tenderizing meat you can slash cooking time almost in half? Perfect for those big family dinners, when you have loads of dishes to prepare and cook -or even for those nights when come home from work exhausted, and spending an hour by the stove just sounds impossible. Sure, we all love a good marinade. It adds flavor and moisture, but it also takes 6 to 8 hours -many chefs even recommend marinading the meat overnight. But who has the time? 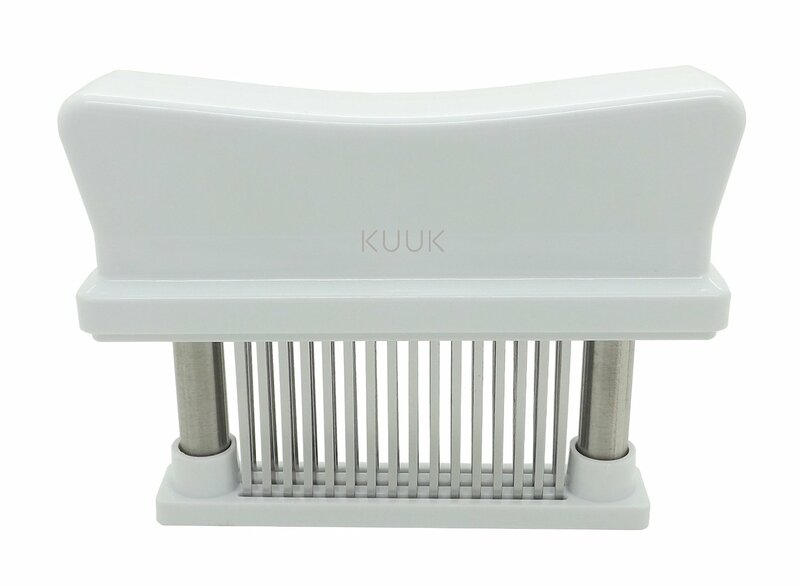 When you use our meat tenderizer, you allow the ingredients to really penetrate the meat. They'll be absorbed faster and better and you'll need to marinade only for a couple hours! Our professional meat tenderizer is dishwasher safe, and in compliance with FDA standard.